She looks like a typical Mediterranean -- "swarthy" and brunette. Last edited by cosmocreator; Sunday, November 2nd, 2003 at 08:05 AM. So it's OK for members here to bash Southern Europeans but it's not OK to criticize "Nordicists?" I don't get it -- please explain this to me. Let me also add that the polite thing for a moderator to do is to reply to a post explaining what the problem is -- if there is a problem -- rather than editing the post itself. It's a basic courtesy that transcends ideological differences. Just out of curiosity: does this forum routinely censor posts? Is this question itself not allowed? Given that she is highskulled and broadfaced, I don't think she can be purely Mediterranean. The size of the skull goes beyond the typical Alpine, and also with the spiralled locks (slightly rufous?) typical of Irish UPs for example. Possibly Alpine+UP, with minor Med if that. The Mona Lisa, known as La Gioconda ~ Leonardo da Vinci. The exact identity of the model remains a mystery. It is thought to be a portrait of Lisa Gherardini (1479 - before 1550), who in 1495 married the distinguished Florentine Francesco di Bartolomeo di Zanoli del Giocondo. "5. We allow criticism of all Ethnicities, Subraces, and Races if presented in a civil and non-slanderous manner. Your attitude and presentation determines whether you might face disciplinary procedures." Hmmm... because the post was edited -- which is highly unusual -- it is impossible for me to prove that I did not attack any European groups. Somehow I feel as though I am in a Holocaust trial, and denying the Holocaust is considered "defamation" to Jews, even though it's a matter of historical accuracy to say the Jews have twisted facts and forced others to accept them. Just a thought -- I sense some take things personal around these parts even though they should not. This is semantics. 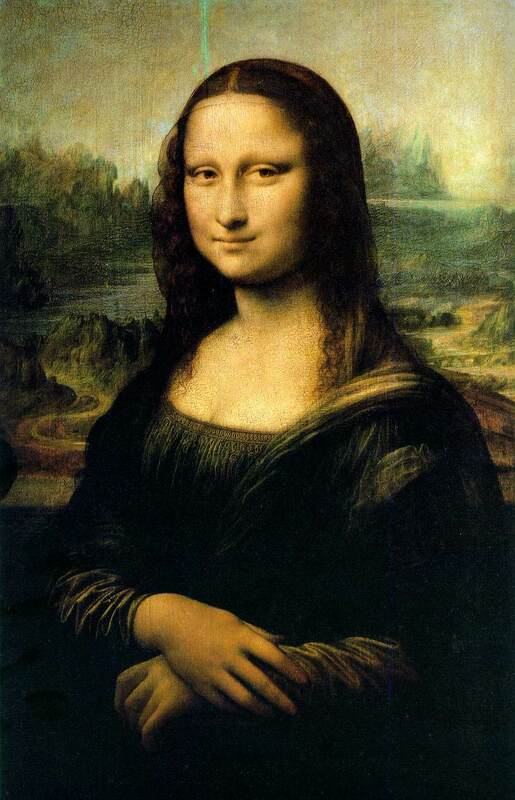 When I say Mona Lisa looks "Mediterranean" I mean she is typical of an Italian. Furthermore, if you are correct that a high skull makes one Alpine, then I am a pretty Alpine person given my high skull. Not that I care to be considered Alpine, since I am a proud Mediterranean (even though some racialists have said I am Alpine or largely Alpine). Yes, Mona Lisa is representative of the classical Mediterranean racial type. She has a moderately long regular oval face, smooth features, a fine narrow straight nose, and curly dark hair. Could this woman exist in the Mediterranean region? Sure. Is she actually a lowskulled, dolichocephalic, slender-faced gracile type? No. She is not purely Mediterranean. It's not semantics. Again.....it's weird to decide to classify humans from a painting, especially from a reneissance painting. This portrait is highly stylized, you can't find such people in reality, I think it's silly to try to classify Mona Lisa from this. Perhaps I can find more realistic drawn SKETCHES of Mona Lisa by DaVinci, these could prove to be more suitable for classification. Mona Lisa is a Mediterranean, that is obvious. There are many bright, gifted, honorable people who are Mediterraneans. But I believe in retaining the uniqueness of the northern European gene pool. This excludes southern (at least) Mediterraneans from my focuss of interest. There is a view among some that an Aryan is to an ordinary white man what a black man is to a white man. This view was put somewhat differently by Hermann Goering using Mussolini but seems to express the same idea. Hitler (Mussolini's friend) said to Goering just before Mussolini's visit to Germany: "I think of Mussolini as a Roman among Italians". To which Goering replied: "Yes, but here in Berlin, he is just an Italian among Germans". What is the Difference Between Atlanto Mediterranean and Gracile Mediterranean? Please classify: that's a hard one (Mona Lisa)!